Over its 30 years, the Parks Conservancy has established a reputation as a leading innovator among nonprofit conservation organizations. Parks Conservancy established, first called the Golden Gate National Parks Association. Began operation of interpretive sales areas at park visitor centers to raise funds for park projects and programs. Established first native plant nursery at Fort Funston—the first of six that grow plants for restoration projects parkwide. Launched Black Point Battery restoration, the first major project of its kind for the Conservancy. Began Parks Conservancy members program; attracted 5,000 members in first three years of operation. Announced plans for restoration of Crissy Field shoreline. Operated seven bookstores to serve visitors and provide quality interpretive merchandise for the benefit of the parks. Developed plan to improve visitor experience on Alcatraz Island, including Cellhouse Audio Tour. Established Habitat Restoration Team, one of the longest-running volunteer programs within the park. Opened visitor information and bookstore facility on Alcatraz. Sponsored the construction of a hiking route linking the Coastal and Bay Area Ridge Trails. Funded and built the Muir Woods Visitor Center. Published first Guide to the Parks. Began work with the National Park Service on conversion of Presidio from post to park. Converted Fort Barry Chapel into a visitor center for the Marin Headlands. Launched the Site Stewardship program, now called Park Stewardship. Supported restoration of historic barracks at Fort Cronkhite, and scientific research around nearby Rodeo Lagoon. Celebrated the Presidio’s transfer from military post to national park. Introduced the William Kent Society of the Parks Conservancy. Reconstructed bridge trail to Point Bonita Lighthouse. Unveiled park identity campaign, featuring the iconic Michael Schwab-designed logos, to visually unify disparate park sites. Installed more than 30 new park entrance signs. Launched Alcatraz Night Tours and produced We Hold the Rock video. 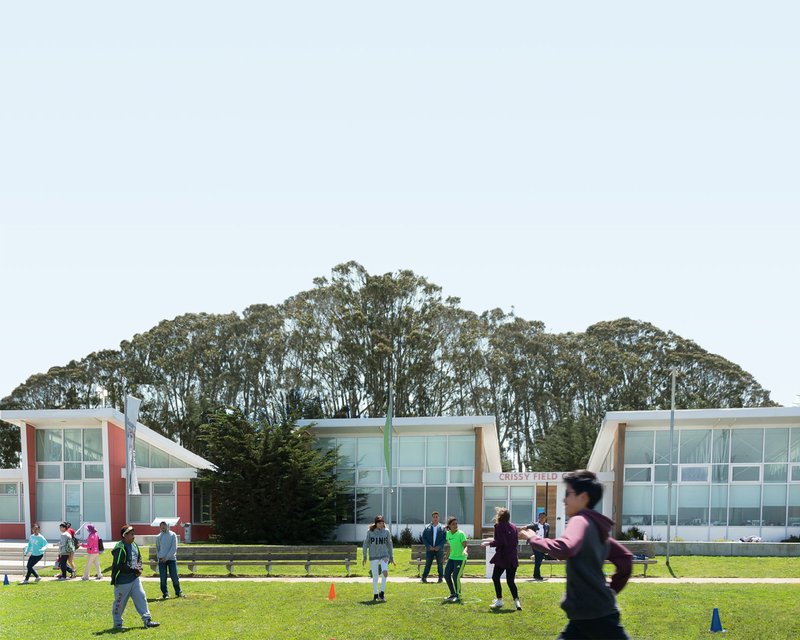 Launched Campaign for Crissy Field; developed master plan for Crissy Field Center. Built Marin Headlands Native Plant Nursery. Began operation of SEAT, the accessible tram on Alcatraz. Finished the Lobos Dunes restoration project, one of the first in the Presidio. Restored Crissy Field tidal marsh; launched “Help Grow Crissy Field” public campaign. Established Crissy Field Center’s first youth advisor council to plant seeds for future youth leadership programming. Provided support for spotted owl monitoring in Marin County. Completed $34.5 million campaign for Crissy Field, celebrating its grand opening with 75,000 community members. Opened the doors to Crissy Field Center, and launched the Inspiring Young Emerging Leaders (I-YEL) program. Began serving the public at the Warming Hut. Dedicated Inspiration Point Overlook in the Presidio. Co-sponsored the transfer ceremony for Fort Baker. Debuted Crissy Field Center summer camps. Launched Trails Forever, an initiative of the Conservancy, National Park Service, and Presidio Trust to build a world-class trail system in the parks. Held first Trails Forever Dinner to benefit trail projects. Supported research of mission blue butterfly populations. Launched Alcatraz Gardens restoration project. Introduced Urban Trailblazers program for youth. Initiated planning and design work for Coastal Trail at Lands End. Began preparations for trail and habitat work at Mori Point. Launched Teens on Trails volunteer program. Designed system of wayfinding signage for California Coastal Trail corridor. Advanced plans for environmental institute at Fort Baker. Celebrated 25 years of support to the Golden Gate National Parks. Cut ribbon on new Lands End promenade and trails. Unveiled first “community trailhead” at Richmond District YMCA. Received historic $15 million gift from Evelyn and Walter Haas, Jr. Fund to complete network of trails and overlooks in the Presidio and improve Rob Hill Campground. Launched Camping at the Presidio (CAP) program alongside National Park Service, Bay Area Wilderness Training, and National Park Service. Completed Batteries to Bluffs Trail in the Presidio. Warming Hut reopened after recovery from fire. Helped celebrate Muir Woods’ 100th anniversary. Celebrated the community-led revitalization of Mori Point. Held ceremony opening the “new” Fort Baker and Cavallo Point national park lodge, products of the the Conservancy’s partnership with the NPS and Fort Baker Retreat Group. Launched programs of the Institute at the Golden Gate, headquartered at Fort Baker. Unveiled new overlook, trailhead, and parking area at Merrie Way at Lands End. Institute at the Golden Gate held inaugural “Turning the Tide” environmental conference. Crissy Field Center moved to sustainably designed interim facility at East Beach, in response to Doyle Drive/Presidio Parkway work. Promoted parks as part of publicity around Ken Burns’ “The National Parks: America’s Best Idea” documentary on PBS. Commemorated 25th year of Golden Gate Raptor Observatory. Began restoration work along lower Redwood Creek at Muir Beach. Established Brian O’Neill Youth Leaders Fund in honor of the late General Superintendent of the parks. Opened new Dias Ridge Trail above Redwood Creek Watershed. Completed new Seed and Plant Lab at Presidio Native Plant Nursery. Finished renovation and expansion of Rob Hill Campground in the Presidio, the only facility of its kind in San Francisco. Supported national “America’s Great Outdoors” initiative to craft 21st century conservation strategy. Celebrated 10th anniversary of the completion of Crissy Field restoration, opening of Crissy Field Center. Debuted the first “Species of the Year” to be featured, the mission blue butterfly. Announced partnership with Golden Gate Bridge, Highway and Transportation District to help celebrate Bridge’s 75th anniversary. Placed new elevated walkway at Muir Beach, marking the completion of major phase of restoration work. Supported transformation of El Polin Spring in the Presidio. Delivered a memorable Golden Gate Bridge 75th Anniversary community festival; opened new trails, overlooks, and a Bridge Pavilion welcome center as “birthday gifts” to the iconic span. Attained LEED Platinum status—the highest possible certification—for the Lands End Lookout and Crissy Field Center. Established the Park Youth Collaborative (PYC) alongside the NPS and Presidio Trust to elevate the quality of youth education programming parkwide. Welcomed the Oceana High School nursery in Pacifica as the sixth Native Plant Nursery in the park. Advanced a proposal for the Presidio Exchange, a park-themed cultural center, in response to the Trust’s call for concepts for the mid-Crissy Field site. Completed a dramatic multi-phase restoration project at Muir Beach and the lower Redwood Creek Watershed. Debuted the innovative Roving Ranger, a former bread truck repurposed as a mobile trailhead/visitor center. Partnered with SFMOMA to bring cutting-edge art and new visitors to the national parks, through Mark di Suvero at Crissy Field. Inspired, through the Institute's Food for the Parks program, a major initiative to bring healthier, more sustainable concessions to parks across the NPS. Marked the 20th Anniversary of the Park Stewardship Program. Formalized the Tamalpais Lands Collaborative alongside the NPS, California State Parks, Marin Municipal Water District, and Marin County Parks; subsequently launched the One Tam initiative to energize community support for Mt. Tam. Brought thought-provoking, world-class art to the parks with @Large: Ai Weiwei on Alcatraz, in partnership with FOR-SITE Foundation and the NPS. Hosted—alongside National Geographic, the NPS, and Presidio Trust—a successful BioBlitz, highlighting citizen science at Golden Gate. Worked with SF Department of Public Health to make San Francisco the first city in the world to incorporate "park prescriptions" into its public health system. Facilitated public engagement and community feedback on the New Presidio Parklands Project. Opened the stunning Fort Point Overlook and Eagle’s Point Overlook. Completed the Battery East Vista, viewing area overlooking Golden Gate Bridge and Fort Point. Launched Mt. Tamalpais version of LINC program, six-week summer leadership program for high schoolers. Advanced major restoration work at Alcatraz, including rehabilitation of the Quartermaster Warehouse. Built a key connector of the Presidio Coastal Trail, an ADA accessible pedestrian/bike bridge over historic batteries south of the Golden Gate Bridge. Celebrated 100 years of the National Park Service with Junior Ranger Jamboree at Crissy Field, Packing the Parks backpacking trip for 70 Bay Area youth, and more. In conjunction with the NPS Centennial, launched a multi-year partnership with the San Francisco Public Library. For library partnership, ran 10 free shuttles from libraries to national park sites, offered ranger talks and "community trailheads" at libraries, and erected "Little Free Libraries" in parks. Teamed with the FOR-SITE Foundation, the NPS and Presidio Trust on "Home Land Security" art installation at coastal defense sites in the Presidio, attracting 21,000 visitors. Advanced the Tunnel Tops project connecting the Presidio to Crissy Field by hosting design workshops and energizing community support. Opened the stunning William Penn Mott, Jr. Presidio Visitor Center in conjunction with the Presidio Trust and NPS. Opened more than 1,000 feet of accessible new trail at Hawk Hill in the Marin Headlands, finishing habitat restoration at a key site for the endangered Mission blue butterfly. Renovated the Crissy Field Promenade. Launched "Connection Lost: Families Unraveled by Prison" art exhibit at Alcatraz and "Portal" global interactive exhibit at Crissy Field. Hosted a citizenship ceremony for 32 young people in the shadow of the Golden Gate Bridge, featuring author Dave Eggers as his book "Her Right Foot" was featured on a StoryWalk nearby at Crissy Field. Launched Crissy Field Next and welcomed more than 700 people from around the region to Crissy Field Day to celebrate the history and plan for the future of the beloved parklands. Received unanimous approval from the San Francisco Board of Supervisors, the San Francisco Port Commission, and San Francisco Mayor London Breed for the Alcatraz Embarkation Project to establish a permanent, high-quality gateway to Alcatraz Island. Hosted the Monterey Bay Aquarium's Blue Whale art exhibit at Crissy Field, raising awareness of plastics dumped in our oceans.